Buoyed by favourable cyclical conditions, low interest rates and national policies, the consolidation of public finances in the European Union and in the euro area made significant progress again in 2017. The analysis in this Focus (in Italian) finds that this trend should continue in 2018-2019, when improvements are expected, albeit with differences between countries, in all the key indicators used in assessing the public finances: the nominal, primary and structural balances and the public debt. This is, very briefly, the picture we can draw from the Stability and Convergence Programmes (SCPs) that the countries presented last April, on the basis of which the European Union’s Economic and Financial Affairs Council (ECOFIN) today endorsed the country-specific recommendations issued by the European Commission. The recommendations will be examined by the Heads of State and Government at the European Council scheduled for next week. Furthermore, at its meeting yesterday, the Eurogroup announced the exit of Greece from the financial assistance programme in August this year. The Focus reviews the budgetary policies of the EU countries, as described in the Commission’s recommendations and assessments, comparing a range of budget indicators for the EU countries, especially those relevant for the rules of the Stability and Growth Pact (SGP) for 2017, 2018 and 2019, and briefly analysing the (expansionary or restrictive) orientation of fiscal policy (fiscal stance) of the EU countries. Finally, the Focus outlines the budget strategies of the main euro-area economies (excluding Italy), namely Germany, France, Spain, Holland and Belgium. The main indications offered by the Focus based on a comparison of the SCPs presented by the countries as part of the 2018 round are summarised below. 1. One country, Spain, is currently in the corrective arm of the SGP implementing the Excessive Deficit Procedure (EDP). All other countries have been in the preventive arm since 2018, including France, for which the Council decided, at the recommendation of the Commission, to close the EDP on the basis of its outturn for 2017. 2. In 2017, the majority of countries in the preventive arm complied with the adjustment path towards the medium-term objective (MTO). However, Poland, Portugal, Slovenia, the United Kingdom and Italy deviated from the adjustment path, although the deviation was not considered significant. The deviation from the adjustment path toward the MTO was significant for Hungary and Romania, while in the case of Belgium the assessment of whether the deviation is significant was postponed to next year for determination on the basis of final data for 2018. 3. Belgium and Italy did not comply with the numerical rule for debt reduction as a percentage of GDP: the Commission, considering all the relevant factors, therefore prepared the report pursuant to Article 126(3) of the Treaty on the Functioning of the European Union (TFEU) and will again assess compliance with the debt criterion in the spring of 2019. 4. 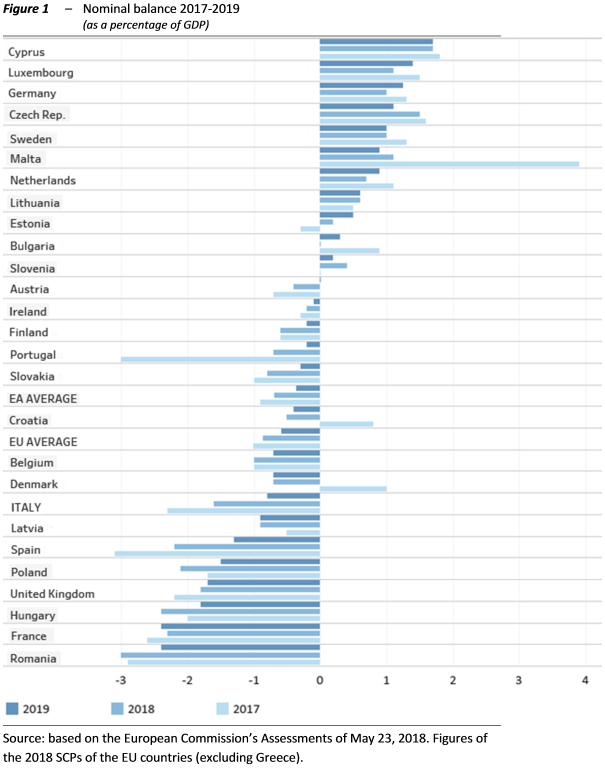 The average nominal deficit for the EU countries is forecast to be 0.6 per cent of GDP in 2019, a slight improvement (0.2 points of GDP) compared with 2017; in the euro-area countries it is put at 0.4 per cent of GDP (Figure 1). Italy, which submitted an SP on a current legislation basis in the absence of a fully constituted Government, shows an above-average trend deficit (0.8 per cent of GDP), although this scenario includes the increase in indirect taxes provided for in the so-called “safeguard clauses”. 5. The average structural deficit projected for 2019 is 0.8 per cent of GDP for the EU countries, while for the euro-area countries it stands at 0.6 per cent of GDP, identical to that in 2017. Italy’s structural deficit is expected to be in line with the EU average and, with Spain, is projected to achieve the largest average annual improvement (0.5 points), again thanks to the safeguard clauses. 6. The ratio of public debt to GDP is expected to decrease on average in the EU countries from 81.8 per cent in 2017 to 78.5 per cent in 2019, while that among the euro-area countries is forecast to decline from 87.3 per cent of GDP to 83.3 per cent(Figure 2). 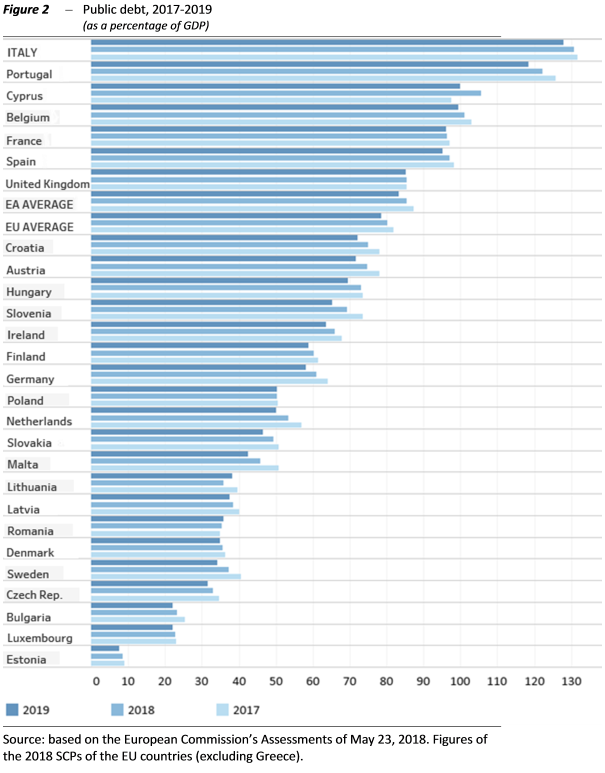 While continuing the downward trend in the debt/GDP ratio that began last year, Italy, with a debt/GDP ratio of 128 per cent, would again be the EU country with the largest expected public debt (with the exception of Greece, which until today has been in an EDP and is therefore not required to submit an SCP), well above the average. 7. For the euro-area countries and the European Union as a whole, the figures in the SCPs point to a slightly expansionary fiscal policy in 2018 with a slightly positive output gap, thus indicating a moderately pro-cyclical fiscal stance. In 2019, however, the slightly restrictive average stance that emerges from a synthesis of the various budget orientations of the Member States would be counter-cyclical, accompanied by an expected further improvement in cyclical conditions. This orientation is substantially in line with that recommended recently by the European Fiscal Board. 8. Turning to the main euro-area countries, Germany continues over-achieve its medium-term objective in 2018-2021. France has maintained its commitment to reduce the deficit/GDP ratio below the 3 per cent threshold in 2017. Spain should reduce its deficit in 2018 to below 3 per cent. The Netherlands continues to over-achieve with regard to its MTO and posted a debt/GDP ratio of less than 60 per cent in 2017. Belgium is at risk of a significant deviation in 2018 and 2019. In addition, according to the Commission’s forecasts, the country would not comply with the debt rule in either of the two years.